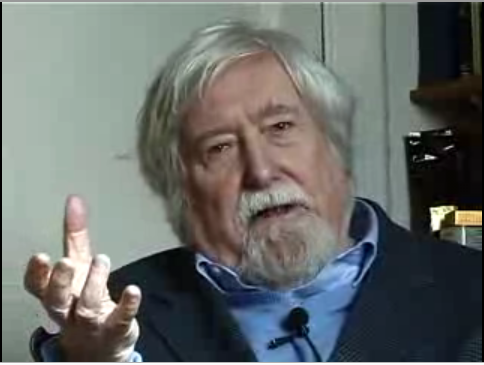 ← Ethnography and the somber realities of "intervention"
Alan Macfarlane interviews Clifford Geertz in 2004. As a number of anthro blogs have mentioned in the past, Alan Macfarlane, of the Department of Social Anthropology at Cambridge, has assembled a massive online archive of video materials, including a lot of in-depth interviews with anthropologists. The interviews, which were conducted over the past thirty years, range from a late-1970s conversation with Rodney Needham filmed by Timothy Asch to a recent chat between our contributor Kalman Applbaum and Jean and John Comaroff. There are interviews with such formative figures in social and cultural anthropology as Edmund Leach, Clifford Geertz, Mary Douglas, Marilyn Strathern, Sidney Mintz, Sally Falk Moore, Roy Wagner and Paul Rabinow, and also scholars from other disciplines, like historian of science Simon Schaffer and literary critic Gillian Beer. The interviews are accessible both through Macfarlane’s own website and through DSpace at Cambridge, (there are also clips available for viewing on YouTube, but these are rather short). Most of the interviews can be either viewed in their entirety online or downloaded — and they can be browsed by name or subject-matter. A list of all the interviews is also available here. This is really an invaluable collection. It is a readily-available historical archive, an excellent resource for teaching and, of course, a great tool for professionally-justified procrastination. Raikhel E. An archive of interviews with anthropologists. Somatosphere. 2010. Available at: http://somatosphere.net/2010/archive-of-interviews-with.html/. Accessed April 21, 2019. Raikhel, Eugene. 2010. An archive of interviews with anthropologists. Somatosphere. http://somatosphere.net/2010/archive-of-interviews-with.html/ (accessed April 21, 2019). Thanks very much for mentioning this. And good to see mention of Kalman A. to whom greetings. Actually, although many of the interviews on Youtube are the extracts, I am putting on almost all of the fully interviews on Youtube and there must be about half of the full set of 170 interviews up there now, I suppose.